We have a nice classic inside slider coming down the eastern slope of the Sierra tonight and tomorrow. Very cold air accompanies the inside slider, but not very much moisture due to the continental (versus marine) nature of the wave. Snow will begin late this evening and continue into tomorrow morning along the Sierra crest and east and pushing all way down past the southern Sierra (Figure 1). Figure 1: Snowfall amounts tonight and tomorrow morning. 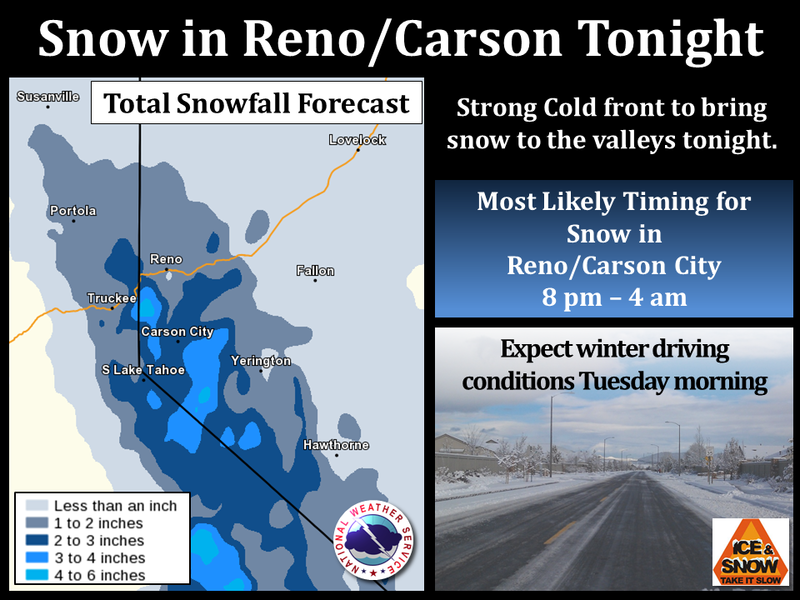 Graphic via NWS Reno. Northwest flow across the Sierra relinquishes to a wave digging south to southwest along and over the Sierra today through tomorrow (Figure 2). The term inside slider describes this storm track due to the south-southwest trajectory of a storm from the inland Pacific Northwest to along or just east of the Sierra. These storms are usually colder and drier due to their origination (inland) away from the modification or moisture of the eastern Pacific. Additionally, these storms usually bring more snow east of the Sierra crest than west due to the upslope flow residing on the east side. 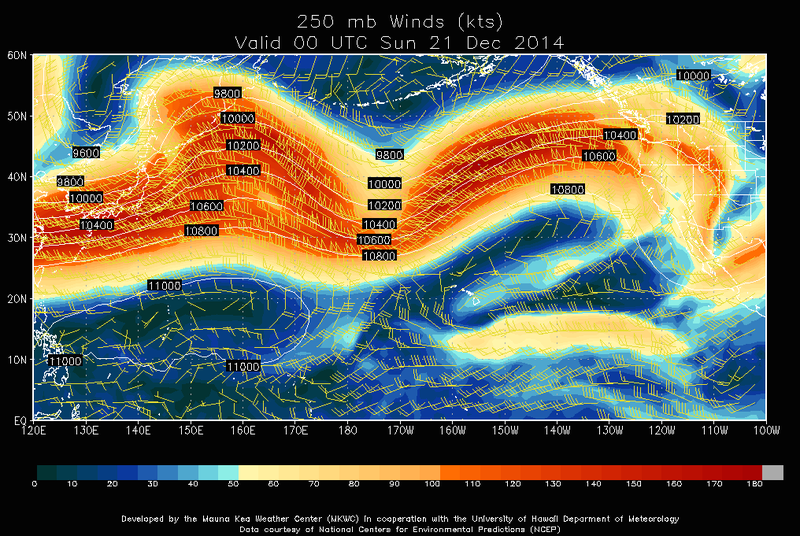 Figure 2: A wave moves from the inland Pacific Northwest back along and over the Sierra over the next 24 hours. This storm track is often referred to as an inside slider, which brings more snow east of the Sierra crest than west. 500 hPa or mid-level winds, temperature, and heights. Image via CEFA/CANSAC. A strong cold front accompanies the inside slider, which will bring north to northeast winds to the Sierra and eastward as it passes through tonight (Figure 3). By tomorrow morning, winds transition to east-northeast. The very cold temperatures and upslope flow will provide the necessary lifting for snow, but the snowfall will be limited due to the lack of moisture. The snow will be very dry and therefore more powdery than we have received this season. Figure 3: A cold front pushes through tonight (8pm-4am). 700 hPa or 9,000-10,000' winds, temperature, and heights. Image via CEFA/CANSAC. So chalk a win up for the Carson Range and the eastern Sierra tonight and tomorrow. We could see some dust on crust scenarios with recent warm conditions and limited snowfall. However, with new snowfall and persistent cold temperatures for the rest of the work week, the conditions should be enough to get you up on the mountain, hungover or not. Although not as evil as its counterpart, the Wicked Ridge of the West, the Wicked Wind of the East can do some serious damage to Sierra shred quality. With no major snow forecast for the next week, I figured I would talk briefly about the wind and cold we will experience. Check out the 700 mb winds (~10,000 ft.) forecast for Tuesday night. There is a 50-60 knot core right over the Tahoe Sierra, with a wind direction of east-northeast. Yikes! This will transport any remaining fresh snow from the favored northeast facing slopes onto the opposite side of the ridge. Not ideal. This is associated with a massive ridge that is pumping up off the coast of BC into the Gulf of AK, and a deep trough digging down the east side of the ridge. This pattern will bring some extremely cold and below average temperatures to nearly the entire CONUS. The forecast temperatures for Tuesday night are shown below. Look at all those negatives! 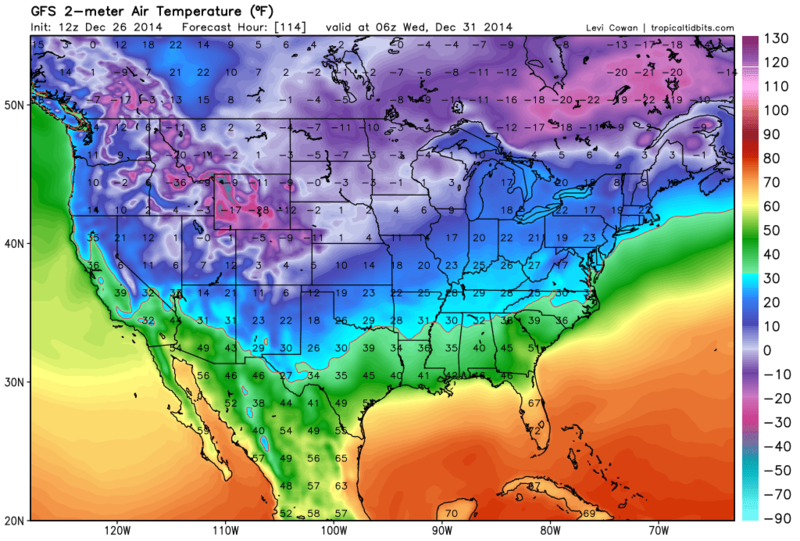 There will be widespread temps of -10 F to -20 F over the northern Rockies. This wind/cold event is still about five days away, so details will likely change. But models have been consistent in showing this feature. One upside is that the nasty ridge is forecast to shift further north during the first week of January, which could allow storms to move back into the west coast. That is out into fantasy land, so we will just keep our fingers crossed. A brief, high-intensity snow event will put down a handful of inches of low density snow this afternoon. Leeward valleys should see a few inches while the crest will be dusted with 6 +/- 2. The event will be quickly followed by blasting north winds as a massive ridge establishes over the eastern North Pacific. This event is a classic 'dust on crust' scenario, as the recently squishy snowpack caused by warm temperatures and rain will freeze solid (good) before getting sprinkled with Colorado-esque crappy fluff (ugh). Good for blowing snow in your face as you scrape along the frozen cryospheric surface...watch out for bumps! Can you say zero bonding? This scenario is even better for transport with the AWESOME northerly winds that are to follow through the night and into Christmas morning. Pack up the sled, kids, and head to points elsewhere as seriously amplified ridging is preparing to hold court in the eastern North Pacific for the extended future. Hello again, Omegasaurus Rexbloxus! Analogous dry extended winter seasons from the last 90 years demonstrate the high likelihood that such a regime will persist again throughout boreal winter. As the new climatic state of the southwestern U.S. progresses towards a two-season year (warm summer and cool summer, with cool summer occasionally punctuated by high intensity precipitation events falling as mostly as rain), we all know what this means. Bicycles, climbing, surfing, and ski road trips. Break out your maps and get that oil change. I wanted to make a few notes on the wind we will see with this storm. It will definitely be windy at the ski resorts during the day Wednesday, and into the evening. For Christmas day, there will be a cold north wind, but nothing that should cause any problems with lift operations. It should be an excellent morning for some cold pow laps...but I'd also expect a bit of dust-on-crust with the recent warming. From a meteorological perspective, the wind during the day on Wednesday looks quite impressive for the valley locations, including Reno. This is caused by a strong pressure gradient, and associated cold frontal passage. The figure below is showing the 10-m wind speed at 1:00 PM on Wednesday. You could see that the valley locations may experience higher wind speed than the mountains during this time, with wind speed approaching 40-50 mph. Thursday and Friday look to be great ski days, so get out there and enjoy some fresh snow. We'll keep you posted if there are significant changes to the forecast in the next 24 hours (unlikely). Ski conditions this past Saturday were...interesting. Things started out pretty good on Saturday morning at Alpine Meadows, with a steady light snow falling from top to bottom. Visibility was poor at the top, but snow conditions were decent. By about mid-day, a funky rain/snow/mist was falling on the lower half of the mountain, and the skiing deteriorated rapidly. With temperatures warming throughout the day, the glorious wintry conditions the Sierra had experienced much of last week turned into a wet, sloppy mess. Last weeks storms brought some nice refreshment to the ski resorts, but for the water year we are still in a bit of a hole in the Tahoe basin and down to the eastern Sierra. The splitting nature of several of the December storms (caused largely by Rossby wave breaking off of the CA coast) brought much needed rain to a good chunk of CA, but the bulk of the energy associated with theses storms was deflected around the Sierra (at least the southern 2/3). It has been interesting to watch this storm evolve in the model runs, with the GFS indicating almost no snow for the Sierra a little over 24 hours ago, and now showing a nice set up for a fast moving mini-dump. This leads to fairly low confidence in the storm, even only three days away. A strong polar jet is currently barreling across the pacific, and the large scale Rossby wave is forecast to start breaking near Hawii over the next 24 hours. 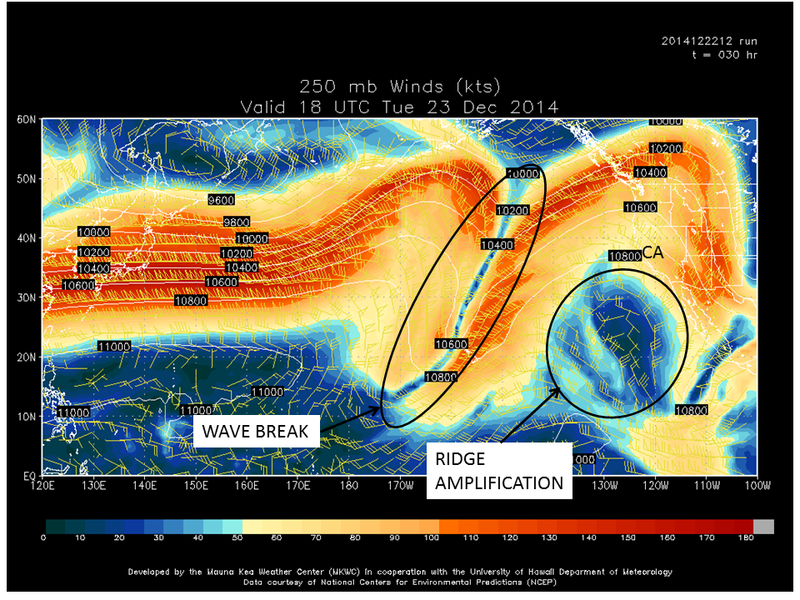 The break in the wave is caused by the strong upper level ridge that is currently pumping up off of the coast of CA. The polar jet redevelops quite nicely, and the energy that was forced south during the wave break event is forecast to merge with the main branch of the jet. 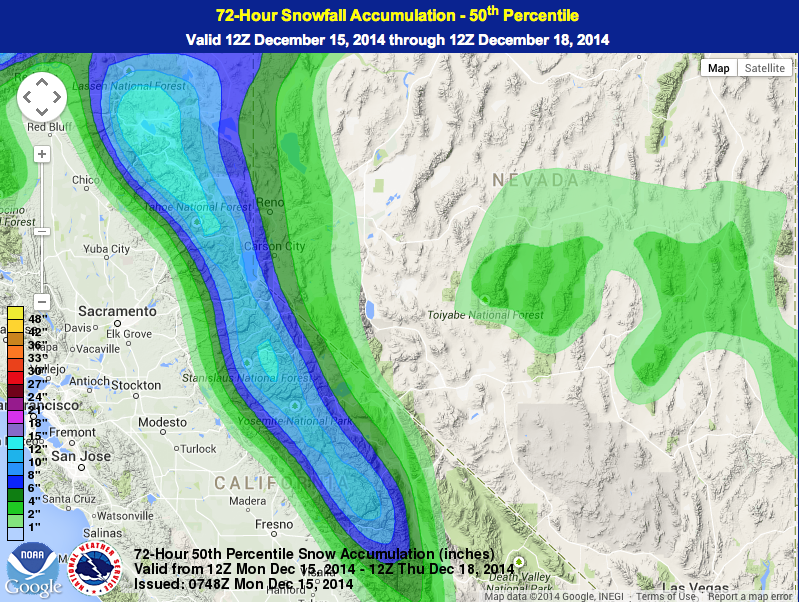 This should benefit the Sierra by drawing in additional moisture from the south-southwest. This is depicted very nicely by the 300 mb winds and column integrated water vapor on 18Z Wednesday morning (10:00 AM). There is also strong forcing and favorable dynamics associated with the frontal passage that should act to enhance Sierra snowfall totals. A large vorticity core (local atmospheric spin) can be seen directly upstream of the Sierra, which will increase the upward vertical motions of the air parcels, and hopefully generate good snowfall. If this storm was moving slower, it could potentially yield significant snowfall for the Sierra, but at this point it appears the wave will move through pretty quickly. We will keep an eye on this storm and have another update soon. 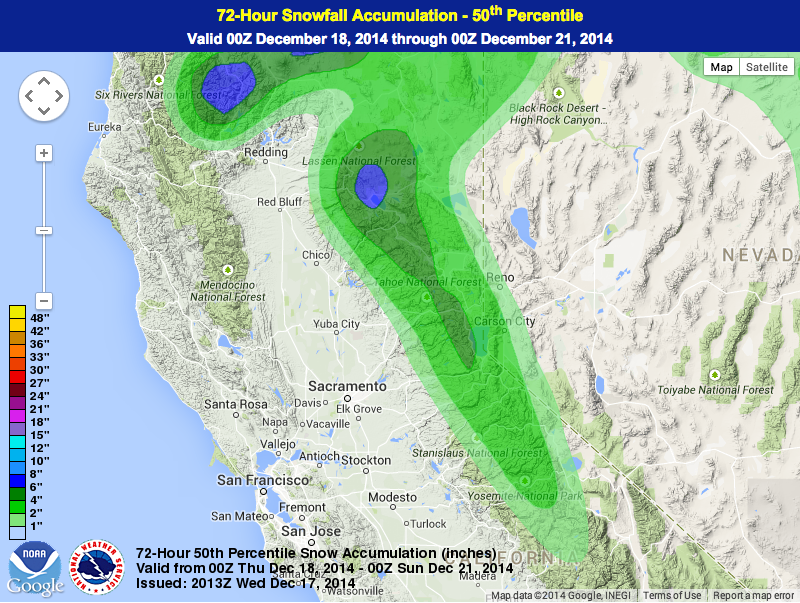 For now, it looks promising for a white Christmas in the Sierra, and good chance of a least a dusting in the valleys. The next 24 hours will be a transition period with another weak disturbance this evening ahead of warm advection developing early Saturday. Snow shower activity should be widespread this evening and then gradually taper through Saturday. All of this is a prelude to a developing upper-level ridge that will assume control of our weather into early next week (Figure 1). Figure 1. Upper-level ridge at 250 mb building into the West coast Saturday evening. 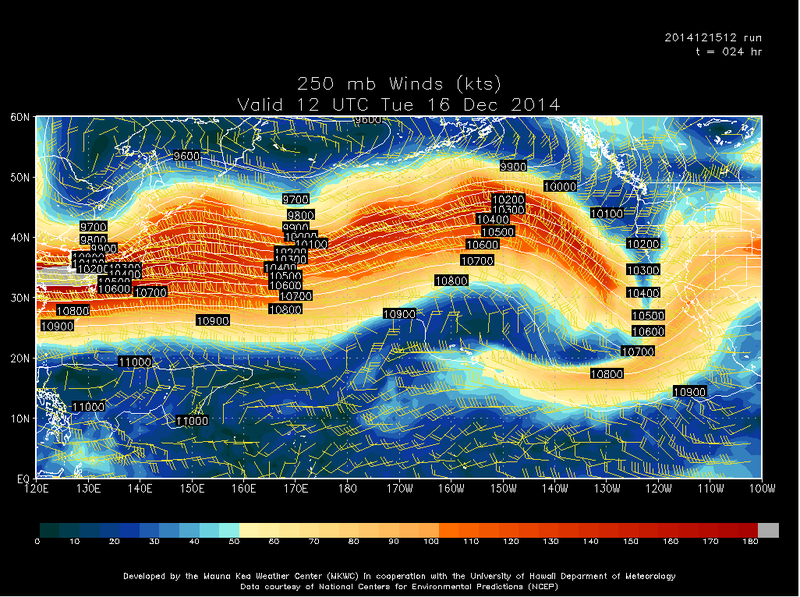 From the GFS model; image courtesy of UHawaii. Looking ahead, the models show amplification of the longwave pattern over the central Pacific on Monday-Tuesday; a reflection of the primary core of momentum associated with the polar jet encountering the upstream West coast ridge. This prompts the polar jet to buckle and break upstream over the central-east Pacific (Figure 2) and preempts a potentially strong storm system affecting the Sierra Wednesday-Thursday (Figure 3). Figure 2. 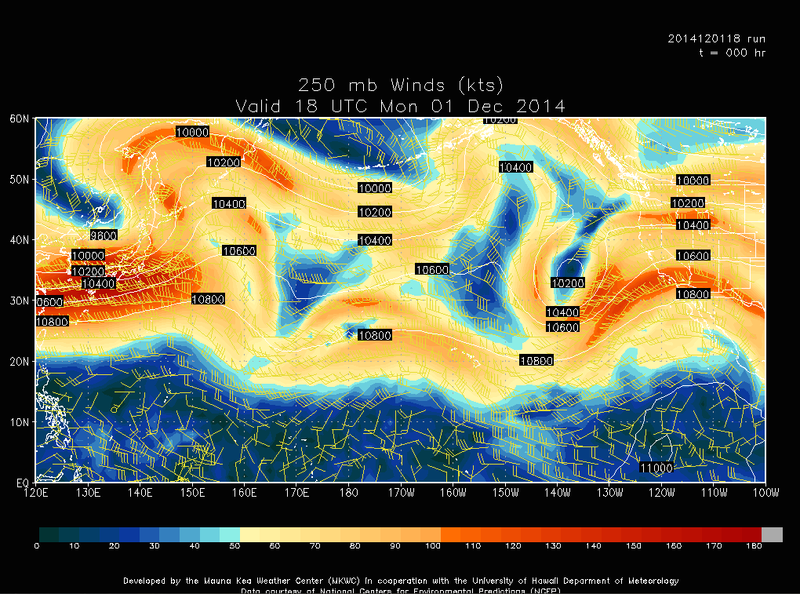 Rossby Wave break over the central-east Pacific at 250 mb from the GFS model. Courtesy of UHawaii. Figure 3. Potential storm impacting Sierra Wednesday-Thursday as reflected at 250 mb in the GFS model. Courtesy of UHawaii. Since Monday afternoon healthy snow accumulations of 6-15 inches have blanketed the Sierra slopes, particularly near-above 7000 ft north and west of the Lake and south along the higher terrain toward Mammoth. Limited amounts have occurred east of the Lake. Figure 1 provides an overview of accumulated liquid across the area. With another small shortwave tonight and weaker one Friday, light snow, approx. 2-6+ inches, will continue re-coating the north-central Sierra, especially north and west of the Lake (Figure 2). Temperatures will gradually inch up as we approach the weekend as an upper-level ridge builds in and quiets activity Saturday through early next week. Will issue a new post and a look ahead Friday. Figure 1. 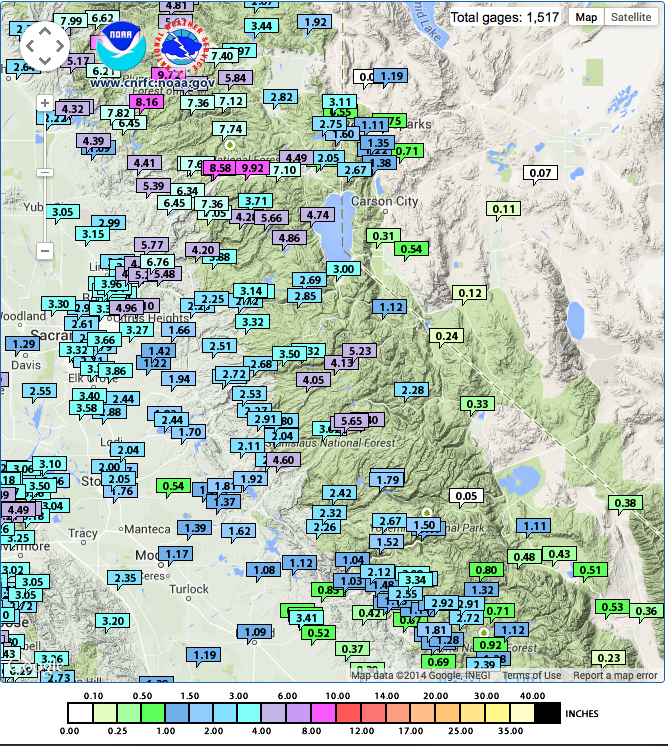 48 hour (Monday-Wednesday afternoon) liquid accumulation across the north-central Sierra. Figure 2 illustrating the 72 hour snow accumulation (Wednesday-Saturday night). Courtesy of NOAA-WPC. I apologize for not posting this weekend. To make up for this shortcoming, this post contains some phenomenal (-ish?) content. First things first. Three waves move through the Sierra this week. One moves through today, another one Tuesday night/Wednesday morning, and the final one near the end of the work week. Intermittent snow continues through Friday and possibly into the weekend across the Sierra. Enough cold air accompanies the first two waves that snow levels will not be a problem, and the third wave is only slightly warmer. Figure 1: 72-hour snowfall accumulation probability forecast at the 50th percentile via WPC. Figure 2: Snow level and 1-hour precipitation forecast valid Wednesday evening. Image via CEFA, CANSAC. You read the what and when, but now the how and why. 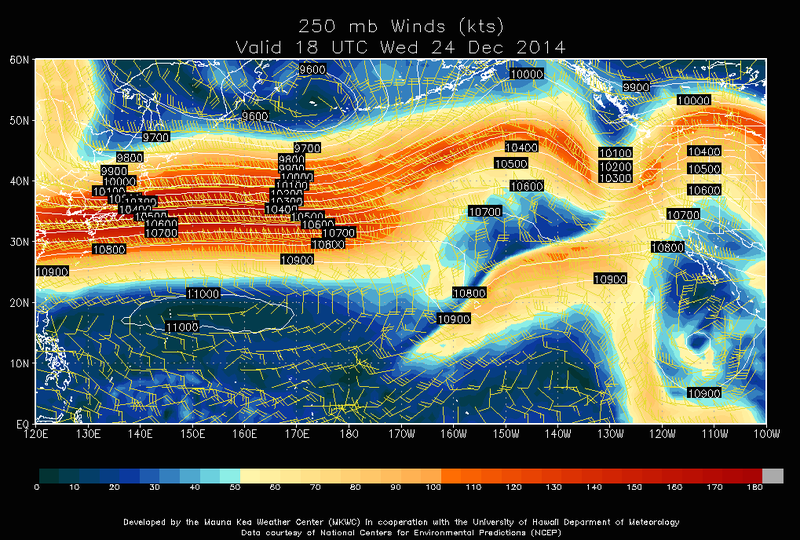 The upper level jet across the Pacific continues to rip zonally (west to east; Figure 3). When this happens, good things (i.e. snow/rain) come to the Sierra. I don't want to complain about the past 2+ weeks because we have snow to ski/board on. However, upon closer examination, we can figure out why these storms didn't quite live up to their potential for snowfall in the Sierra. 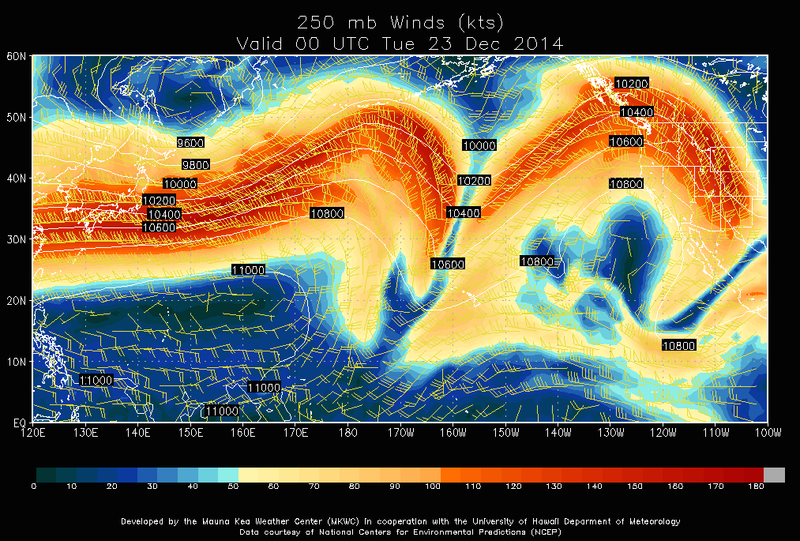 Figure 3: 250mb (upper level) winds across the Pacific. Via University of Hawaii Department of Meteorology. I discussed why the storms did not affect the Sierra as the models predicted 3-7 days in advance with the other Powdiction meteorologists and our esteemed mentor Dr. Michael Kaplan. The lack of observations across the Pacific affect the initialization and forecasts models generate, which always presents a challenge. Secondly, the overall long wave pattern across North America and its adjacent oceans contributed greatly to the storms' effects on the Sierra. The increasing meridional (south-north) structure of the winds and temperature of the past few waves moving onshore contributed to the lack of snowfall in the Sierra (note the break in the jet stream in Figure 3). It represents a departure to the mostly zonal flow across the Pacific, so why is this happening? As we have mentioned many times before, ridges control weather. Figure 4: 500mb (mid-level) heights, temperature, and winds via San Jose State University valid today. The cross North Pacific jet slams into a negatively tilted, strong upper level ridge over the Pacific Coast (Figures 4-5). This causes the wave to break and the flow to split. Think of a stream where it encounters a rock or boulder. Eddies form on the sides and the main flow splits around the rock. The Sierra represents a rock in the stream as well, but the fluid depth of the atmosphere is 2-3 times higher than the Sierra. The Sierra or any large mountain range affects the atmosphere, but a strong upper level ridge greatly exceeds the impact of the Sierra or any mountain range on weather patterns. Figure 5: 250mb (upper level) winds and heights with isotachs shaded via NCEP valid today. A strong, negatively ridge has generally been present over central North America. The long wave pattern shifted to a ridge shifted over central North America from a ridge over the Pacific Coast. Therefore, when the strong jet encounters the ridge, the polar jet emerges with a northern and southern branch with Rossby wave breaking as another result (Figures 3-5). The leads to a storm track across the southern United States (Figures 4-5). These signals represent some of the teleconnections of El Nino (save this for another post). For the Sierra, the increase of southerly flow decreases the orographic lift, which decreases the orographic precipitation. 15-45 degrees difference in wind direction drastically changes orographic influence and the probability of precipitation falling east of the Sierra crest (i.e. spillover precipitation). Additionally, the waves tend to push south due to the splitting and the negative tilt, which moves the moisture plume and best dynamics further south before it can really impact and move across the Sierra. For further reading, Dettinger et al. (2004) 'Winter Orographic Precipitation Ratios in the Sierra Nevada-Large Scale Scale Atmospheric Circulations and Hydrologic Consequences' details orographic precipitation in the Sierra in great depth. In conjunction with the long wave pattern, the Madden-Julian Oscillation (MJO) was active and in preferable phases for the western United States during the past 2-3 weeks. The MJO signal weakened, but there is some net lag effect still lingering. The Arctic Oscillation (AO) appears to be heading back towards negative in the next 1-2 weeks, which usually indicates more cold air intrusions in central and eastern North America. The MJO weakening, the AO negative forecast, and a forecast retrograding the long wave pattern, it appears we are heading towards Ridgeasaurus next week. For now, let's enjoy the next few waves to provide a powdery refresher to a solid base in the Sierra. ~1 ft @ 6000ft, 2.5 ft above 8000ft with wind loading pushing 4ft in choice locations by Saturday. Strong southerly flow will limit spillover and totals in the Sierra and boost them in the Coast Ranges and southern Cascades but all is welcome at this point! 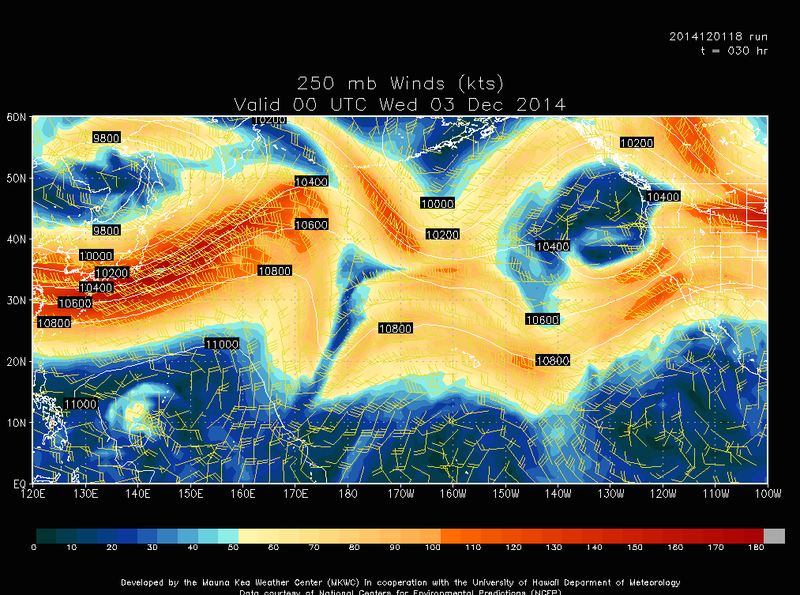 Thank an upstream intensification of Pacific jet momentum just east of the dateline (happened this afternoon). Doh! The southern Cascades and Northern California reservoirs look to enjoy the gold medal performance. The Sierra Nevada will still enjoy a podium finish, nothing to be ashamed of when you recently have been lurking amongst a series of disappointing boreal winter performances, last week notwithstanding. While the more meridional orientation of the jet will reduce total Sierra awesomeness, we will score a bit lower snow level in trade. This is much needed from both a skiing perspective as well as a hydrologic one. Keep your eye on places like Lakes Shasta and Oroville at first then turn south to the Central Coast. These places will receive a nice soaking and long-awaited filling as well as some high elevation snow (in the Sierra) to support later season streamflow. Get those soils saturated and produce some runoff! Our favorite descents of Northern California will be stackin' snowflake chips and Saturday morning should show some wonderful satellite views of stratovolcano snow-cones. California is about to get hosed down! For the central Sierra Nevada, a solid foot of snow at 6000ft will be excellent, with favorable regions of the crest and higher lands seeing highly variable totals in feet (2-4; watch for some sweet cornices on slightly non-standard aspects) due to crystal advection by everybody's favorite, the turbulent component of the wind! The high elevation faceted layer might just go in a few more heavily loaded places...Although from a general snowpack stability trend standpoint, the past week couldn't have been much better in minimizing continuous basal facet development and contributing to overall cohesion of the now awesome snowpack provided by the "sweet eastern tropical Pacific moisture export" (SETPME). Your favorite wind pockets will be skiing quite nice due to the stronger winds and lower density snow (by Sierra standards, which is the GOLD standard for general awesomeness. Eagle's Nest. Need I say more?). At lower elevations watch out for the geology underfoot. Enjoy a few feet of wind tomorrow and good skiing ahead! After three drought stricken winters in a row, it's easy to forget that even an average snow year in Tahoe is still A LOT of snow. The storm last week brought much needed short-term drought relief to Tahoe and all of CA in the form of heavy rain and high elevation snow, which helped to replenish the parched soil moisture. 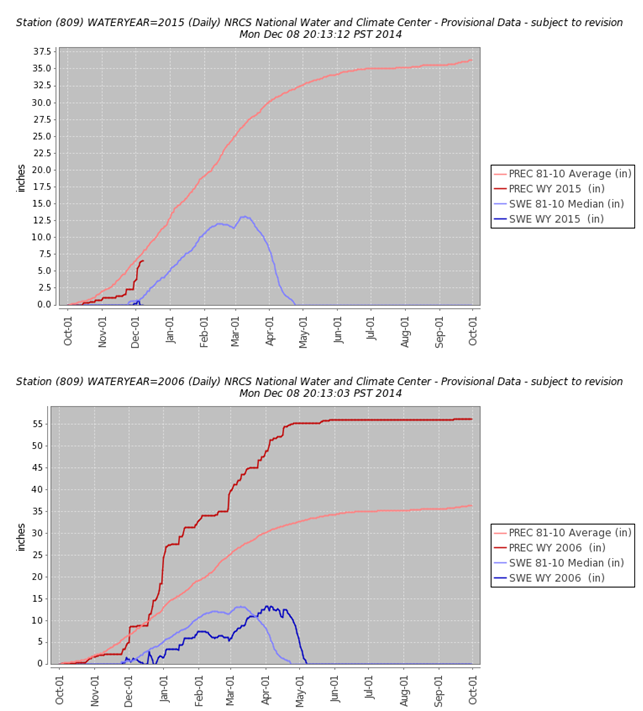 But when we take a look at the SNOTEL data from Tahoe City (elevation 6,797 ft.) and Squaw Valley (elevation 8,029 ft.) you can see that the precipitation and snow water equivalent for the year are just about average, or slightly below average. 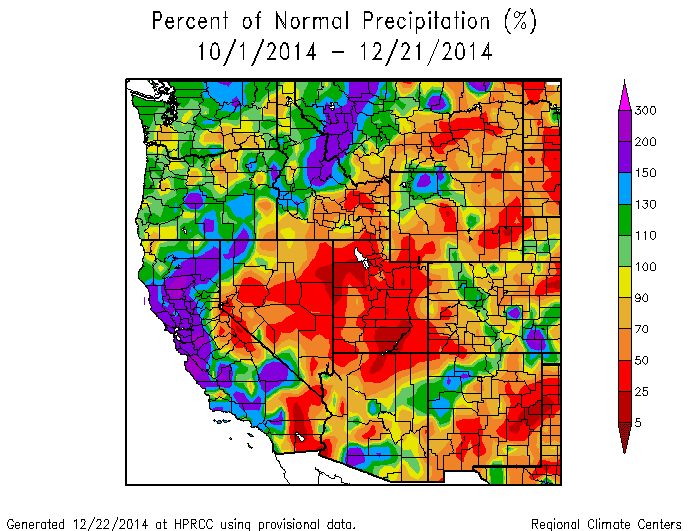 The bottom line is this: it's going to take a massive winter to fully recover from the extended drought. There is a strong storm currently in the Pacific that will move onshore Wednesday night into Thursday, and dump some more Sierra cement. Below are the forecasted snow totals for Wednesday-Friday. Yes, you are reading that figure correctly: 24-48 inches of snow over the Tahoe crest and Mt. Rose!! We are still a few days away and things can change quickly, but models have been consistent that past several days in heavy precipitation amounts. The thing that is still uncertain are the snow levels. Feet of snow is looking very likely above 8,000 ft., but between 6,000 and 8,000 ft. there is less confidence in the snowfall forecast. The 700 mb (~10,000 ft.) temperatures indicate that snow levels could fall to lake level overnight Thursday into Friday morning. Notice the -5 C line (blue dotted) to the east and south of Tahoe by 4 AM on Friday morning. This is looking much better for snow levels compared to the previous storm. We'll have a detailed update on Wednesday with snowfall amounts, snow levels, and timing of the incoming storm. Get those skis and boards waxed up, it could be fun weekend of riding! 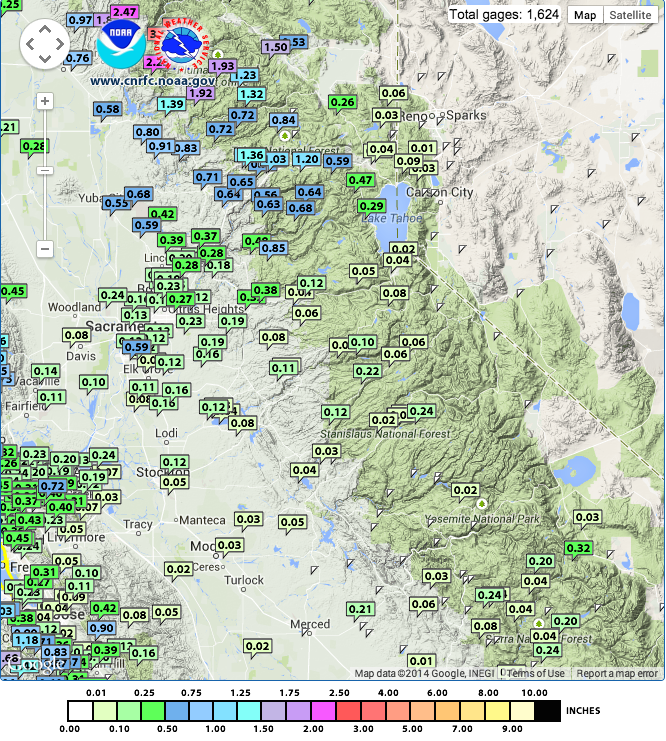 Since Friday afternoon, the west slopes of the Sierra have seen variable amounts of precipitation mainly in the form of light rain (snow) below (above) 8000 ft with higher amounts north and west. Figure 1 provides a spatial overview with precipitation amounts ranging from a few hundreds to well over and inch across the area. Figure 1. 24 hour precipitation totals (Friday-Saturday afternoon) from the CNRFC. As noted in Nick's earlier post, the Pacific remains active through next week with a larger storm system anticipated Thursday-Friday. The MJO pattern remains favorable over the short term while El Nino teeters positive. Note the gradual positive progression in the surface temperature anomalies over the southern Pacific over the course of 2014 (Figure 2). A broad positive anomaly remains persistent since May from the 140E meridian eastward across the southern Pacific, with a slight decline in August (southern-central Pacific) and then a restoration through September and especially November. Typically, a wetter and more active pattern becomes favorable for central CA during slightly positive to near-neutral El Nino conditions. Monitoring these anomalies for the month of December and the associated atmospheric response will be important for our upcoming Winter season. Figure 2. 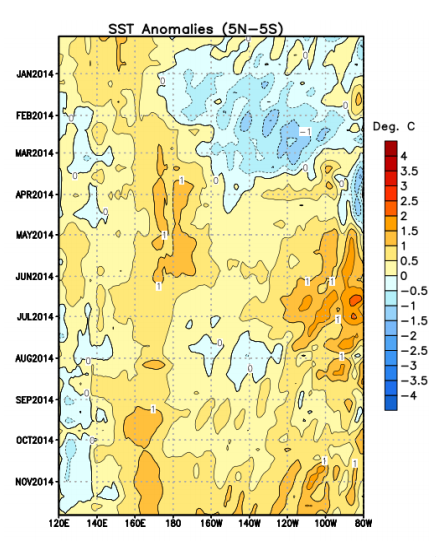 Sea surface temperature anomalies straddling the equator west to east across the Pacific Ocean (left to right) for January through November 2014 (top to bottom). Courtesy of CPC. Since this weekend, areas in the Sierra and around Tahoe received up to 10" of precipitation, with most areas receiving 1-5" (Figure 1). 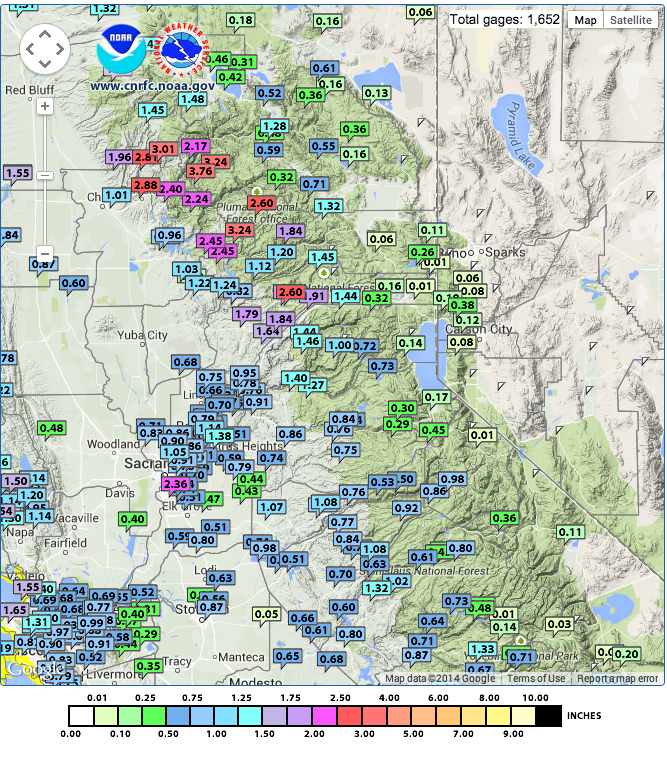 Some of the precipitation did fall as snow with snow levels varying between 5000' and 8500' during both storms. Resorts received anywhere from 14-33" of new snow in the past week (with the bulk of it accumulating on the upper mountain portion of the resorts). 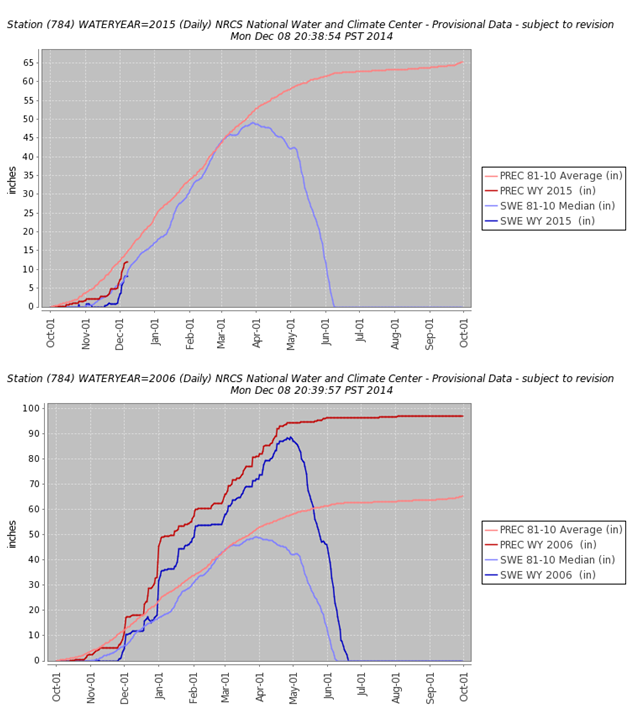 Figure 1: 5-day precipitation totals from the CNRFC. All of these conditions were met to a certain extent, but the strong southerly flow and deep moisture helped the precipitation to spillover. When we have a quiet week (hopefully not soon), we will dedicate a full post to the spillover precipitation phenomenon. Figure 2: Snow level and 1-hour precipitation valid Friday evening at 10 pm via CEFA-CANSAC. We do have another storm that will arrive Friday afternoon and continue overnight into Saturday. The storm track is to our north, which is where the coldest air and heaviest precipitation will be too. However, any precipitation, especially snow, is welcomed. Another storm will arrive Sunday and into Monday. It is slightly weaker than the Friday/Saturday storm. The Pacific appears to stay active for the next week. The Madden-Julian Oscillation (MJO) is in Phase 5 and is forecast to go to phase 6 before weakening as move towards phases 7 and 8 (Figure 3). MJO phases 5-8 tend to favor the western United States for moisture transport and atmospheric wave activity. Another strong cross North Pacific upper level jet is forecast to form next week, which also equates to a more active weather pattern for the West Coast. Figure 3: MJO phase diagram. The green solid line and yellow thin lines represent the model outcomes for the MJO. If the line is outside the inner circle, MJO is active enough to impact weather. The phases for the MJO indicate locations and to a certain extent impacts of the MJO. Image via CPC. We will have another update this weekend about the upcoming storms and examining the MJO and El Nino-Southern Oscillation moving forward. Although ski conditions remain less than ideal, the recent wet snowfall will only help augment the base requirements for mid mountain and above. Resorts are reporting variable snow amounts since Friday with 3-6"+ at Kirkwood and Mammoth and higher amounts north of the Lake; 9-16" bottom to top at Sugar Bowl and 13" at Squaw/Alpine. 1-2 ft. of snow above 7500 ft.
After a brief hiatus for next 18-24 hours, another extended period of precipitation rolls in mid-day Tuesday and continues into early Thursday. Unlike the pervious system, a subtropical plume of moisture will feed across a broad swath of the Sierra (and further south) with liquid amounts exceeding 2.5" (see Figure 1 and 2). However, as before, temperatures associated with this system will be mild yielding wetter snow accumulations concentrated above 8000 ft early on before dropping to 7500 ft during the latter half. Estimated snow amounts by Thursday morning will be 18-24" above 8,000 ft with isolated higher amounts further south associated with higher terrain; 10-15"+/- between 7500-8000 ft; 4-8" between 7000-7500 ft; and couple wet inches near and just below 7000 ft. Figure 1. 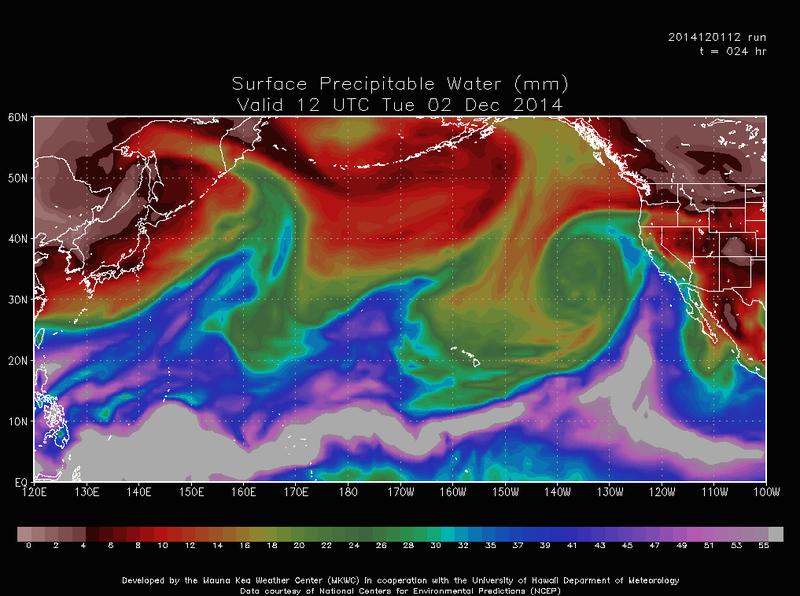 Depiction of precipitable water (mm) lifting toward central and southern CA. Courtesy of UHawaii. Figure 2. 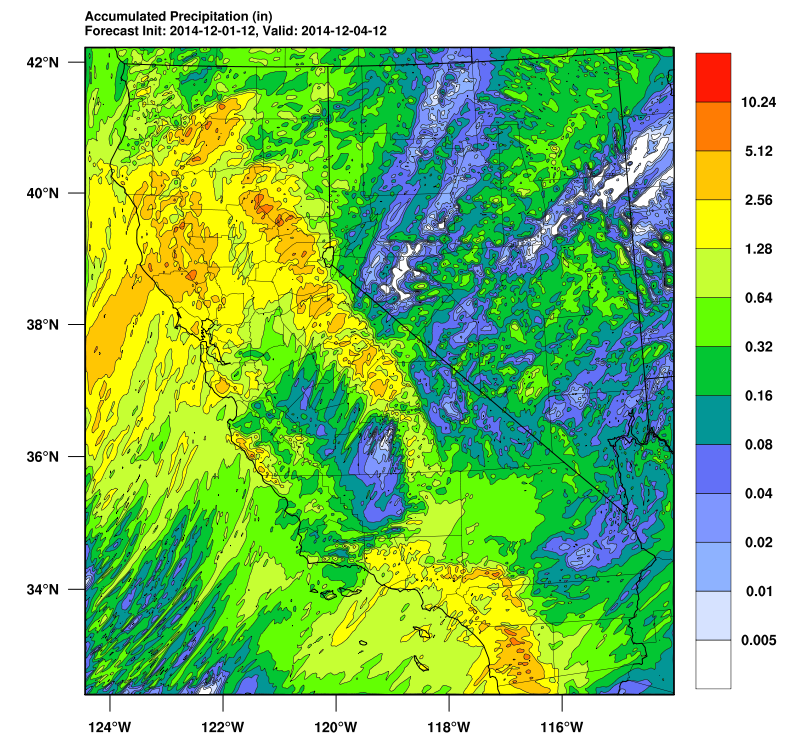 48 hour accumulated precipitation (in) from 12z Tuesday 2014-12-02 through 12z Thursday. Courtesy of CEFA/DRI. Like the previous storm, this next system reveals a complicated forecast and may require updates. The overall synoptic picture reveals a closed upper-level low parked off central CA coast (Figure 3). Over the next 18-72 hours, this system gradually pinwheels east prompting a southwest to northeast subtropical fetch into the central Sierra (Figure 1) with precipitation breaking out around mid-day Tuesday and lasting into Thursday morning. As the circulation moves into CA, and transitions from a closed low into an open wave, the associated upper-level jet structure splits driving 2-prongs of concentrated kinetic energy northeast into the central-northern Sierra and another southeast into southern CA (Figure 4). The SW to NE orientation of the northern jet structure, and its location of slightly south of Lake Tahoe, favors good orographic lift and upper-level divergence for the northern-central Sierra. Figure 3. 250 mb wind (kts). Note the closed low circulation off the central CA coast. Courtesy of UHawaii. Figure 4. Same as Figure 3 except here the 2-prong kinetic energy jet structures are depicted entering central and southern CA Tuesday evening. Courtesy of UHawaii. Although with mild mid-level temperatures (< -5C @ 700 mb), and limited colder air aloft, the nature of the snow accumulation will be wetter and more dense keeping accumulations down. However, this event shall yield an excellent snow base for the Sierra slopes establishing a nice foundation for future Pow (we can hope). As this storm exits on Thursday, residual moisture and light instability showers will linger during afternoon. The next trough is progged for Friday. Although at this time, the latter appears to take a more northward trajectory.